The Pre-Preparatory School Department admits boys from the ages of four to six. The Head of Department oversees the boy’s development from Reception through to Year Two, after which they join the Main School at seven plus. The class teachers each work with a classroom assistant, providing a good pupil teacher ratio so that there is ample scope for individual help and support. The emphasis is on the acquisition and development of basic skills in literacy and numeracy, and this is combined with a range of work and constructive play to fill the boys’ lives with inspiration, stimulation and fun. Perseverance, creativity and independence are fostered through practical hands-on experience, investigations and a range of other activities. Some skills, such as phonics and number bonds, have a formal element in their teaching and learning, but all are applied in a range of situations to enhance understanding. Boys read, and are read to, daily. 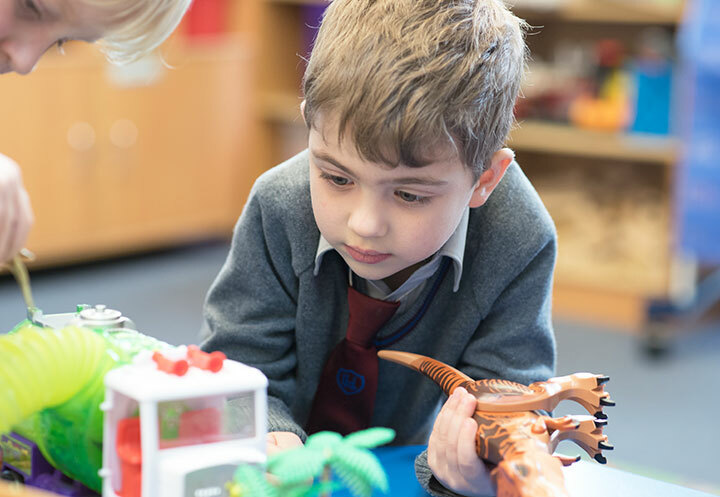 Throughout the Pre-Prep, boys are expected to try their best, treat others with kindness, to listen and to take responsibility for their actions. The School's ethos is of kindness and endeavour. We hope to build a strong foundation of skills, confidence and understanding, for a lifetime of learning.